At least five cameras, phones and iPads were trained on Cia Panicker MD’18 as she stood clutching the red envelope that contained her destiny. “This is so much pressure!” she said with a nervous laugh as her family and friends stood by quietly, ready to hit record. Panicker was just one of 118 fourth-year medical students who gathered late on Friday morning in the lobby of the Warren Alpert Medical School. Buzzing with excitement and a bit of trepidation, they sipped champagne in their finery alongside classmates, significant others, and family members. 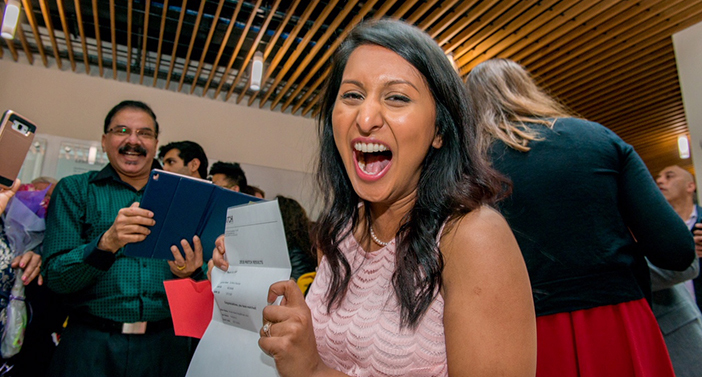 And at exactly noon, along with thousands of other medical students across the country, they opened envelopes that would forever impact their futures. For med students set to graduate this spring, Match Day is the culmination of four busy, stressful years of rotations and classes—not to mention a grueling nine-month application and interview process. It’s the day they learn where they’re headed for their medical residencies, which could last anywhere from three to seven years. Panicker and 11 other Warren Alpert medical students found out they would stay in Rhode Island after graduation, learning and practicing at hospitals affiliated with Brown. More than half of the MD Class of 2018 would stay in the Northeast in Boston, New York, and Philadelphia, among other cities. Others would move west for residencies at prestigious hospitals in Chicago, San Francisco, Houston, and elsewhere. All 118 had reason to be proud: They were part of the Medical School’s largest ever matched class. View the full MD’18 match list here.